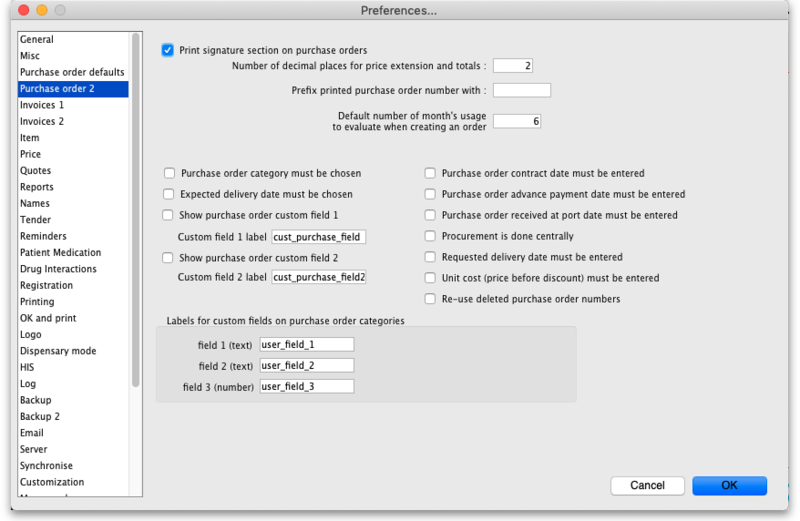 There are two tabs of purchase order preferences in the File > Preferences… menu item. This window allows you to enter text that will be printed on Purchase Orders. The easiest way to see how these fields will look on a Purchase Order is to fill in the fields and then print a sample Purchase Order. Note that we are willing to design custom Purchase Order forms to meet individual needs. When this box is checked a section will be printed on Purchase Orders that shows the authorising officer(s) and includes a space for signatures. This is applicable if you print Purchase Orders and post them to suppliers, but should most likely be turned off if you send Purchase Orders via email. This field allows you to specify the number of decimal places that may be entered in the price field on Purchase Orders. This will override the currency format setting in tne Misc tab only for the price field on Purchase Orders. Enter the number of days to “look back” when evaluating each item's usage to calculate the amount of stock needed. Entering a higher number will give a better long term average, but will mean that orders take longer to create. Check if you need a Purchase order category to be chosen on every purchase order. Check if required, leave unchecked if not. Check this box if you would like an extra field added that you can customise and use for your own purposes. The space below this check box is for you to enter the name of your custom field. If you require this information on your purchase orders then check this box - this will force users to enter it when a purchase order is created. If you check this, the Advance paid field must be completed when a purchase order is created - a user will not be able to save a purchase order without entering it. If you check this, the Received at port field must be completed when a purchase order is created - a user will not be able to save a purchase order without entering it. This option is only relevant for a synchronised system (refer Remote Synchronisation). If you select this option, purchase orders for stores on sync satellites can only be prepared, confirmed and finalised on the sync primary. There is a work-around if you need some stores on some sync satellites to do their own purchase orders. For help with setting that up, contact support@msupply.org.nz. Fields 1 and 2 accept text entries, field 3 accepts numeric entries. The use of these fields is optional.